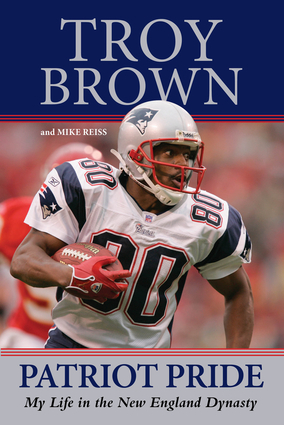 Spotlighting a New England sports icon, Patriot Pride: My Life in the New England Dynasty chronicles the extraordinary life and career of Troy Brown, the talented athlete who played 15 seasons with the New England Patriots. In his own words, Brown demonstrates how his grit, hustle, and hard work endeared him to a generation of football fans. The player explores his own past, relating how he made it through college and into the pros despite people giving up on him several times. Brown’s years with the Patriots are documented in detail, covering what it was like to play for Coach Belichick, why Tom Brady has been so successful, and the secrets behind the Patriots’ three Super Bowl wins. A reflection on Brown’s historic career at Marshall University that included winning an NCAA National Championship as well as setting the NCAA records for kickoff return average and kickoff return touchdowns, both of which still stand. Troy Brown retired as a three-time Super Bowl champion, New England’s all-time leader in receptions, and a fan favorite among Patriots fans due to his relentless dedication to the franchise and his numerous critical moments in playoff games. Patriot Pride: My Life in the New England Dynasty is the ultimate look back and celebration of the career of one of the greatest players of the New England Patriots’ dynasty during the 21st century. Troy Brown played for the New England Patriots for 15 seasons as a wide receiver, defensive back, and punt returner. He retired from the NFL after the 2007 season. A graduate of Marshall University, Brown currently works for Comcast SportsNet New England and serves as co-host of NFL Sunday on Sportsradio 850 WEEI. Mike Reiss has covered the Patriots since 1997. He is a reporter and analyst for ESPNBoston.com. Mike is a lifelong New Englander and lives with his family in suburban Boston.